On Friday, Mayor Gangambike Mallikarjun expressed her utter displeasure over waste segregation in Bengaluru which has slipped from 50 per cent (two years ago) to 25 per cent. 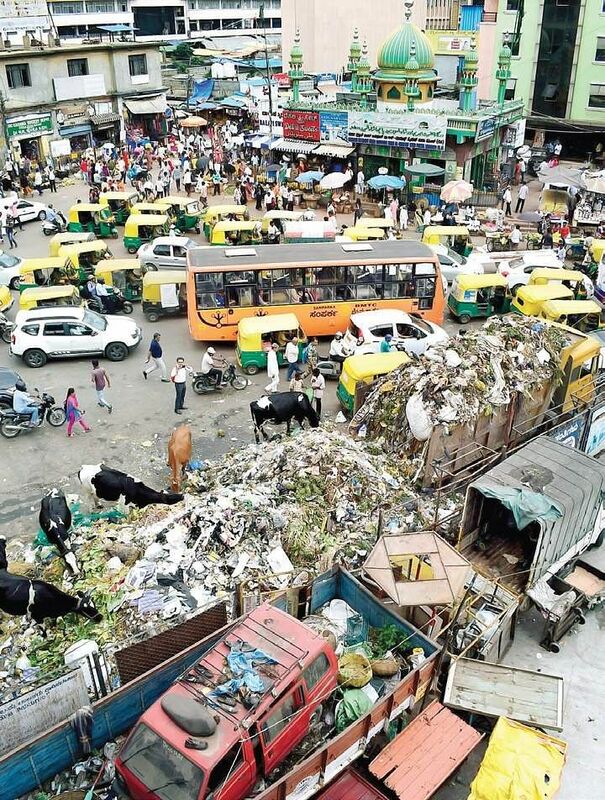 BENGALURU: A drastic fall of 25 per cent in waste segregation at source as well as before it ends in compactors or dumps, has forced the Bruhat Bengaluru Mahanagara Palike (BBMP) to consider going for a new garbage contractor system that would focus on micro-level plans for waste segregation. The new system is planned to be implemented in November 2018. The city generates more than 4,500 metric tonnes of waste daily, of which 40 per cent is wet waste. According to N Ramakanth, BBMP Solid Waste Management Committee member, there are around seven processing units wherein wet waste is ending up to only 20 percent of their capacity. At the same time, BBMP’s dry waste collection centres are getting lesser dry waste. The mixed waste is being sent to abandoned quarries at a few locations which are turning into landfill sites. Although the public are segregating waste before handing it over to the pourakarmikas, the compactors standing in queues at the quarries make them to return late. This causes BBMP pourakarmikas to unload previous day’s waste into the compactors. This delay in the process in turn causes mixing both the wet and dry waste into the compactors, when an attempt is made to reduce the waste backlog. Mayor Gangambike said city’s waste segregation has drastically fallen to 25 per cent because there has been a failure on the official side too. “I will recommend the BBMP Commissioner to take action against ward engineers and health inspectors who have failed to keep clean or if there is less segregation,’’ she said. D Randeep, BBMP Special Commissioner (Solid Waste Management) said they plan to call new tenders from contractors for picking waste. Unlike the previous time, the tender will be called ward-wise, which will be a complete micro-ward management, details of which will be made available on BBMP website for the public. The public can check the number of pourakarmikas working in their wards along with their phone numbers, and details of compactors and tippers will also be mentioned. “If they find the number on the website varies from the one seen on ground, they can raise a complaint. The ward engineers, health inspectors and zonal commisisoner will also have these details,’’ he said.